There are certain milestones in a parent’s life. Introducing your child to solid food. Moving them from the crib to the toddler bed. Walking them to kindergarten for the first time. And eventually, showing them their first John Waters movie. 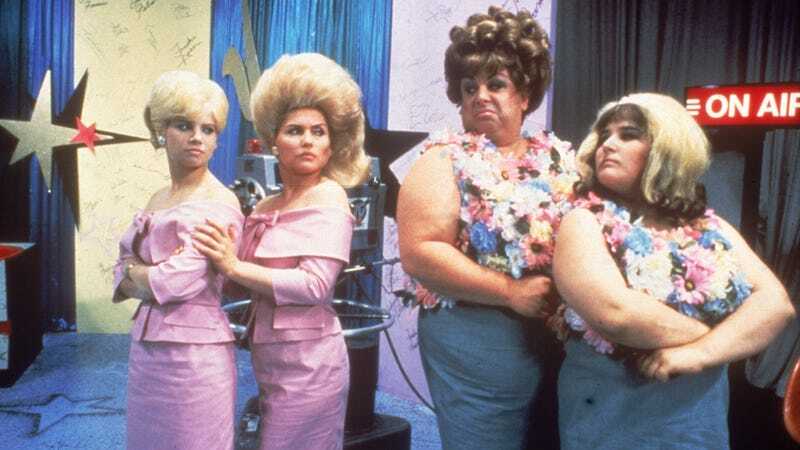 Actually, Hairspray will also be their last John Waters movie for a good, long while, as it’s Waters’ sole PG film. (Despite the joking suggestions from my co-workers, I’m not about to let two kids who used to eat gravel on the reg watch Pink Flamingos.) I first saw Hairspray in 1988 at Chicago’s Biograph (where John Dillinger was shot); I remember people were dancing in the aisles. But I hadn’t seen it in many, many years, so on the occasion of its 30th anniversary, I forced my family—my husband and my 11-year-old boy-girl twins—to watch it with me. We started with the trailer, which didn’t really thrill anybody. “The ’60s were full of stupid hair and stupid dances,” my son declared. And so we were off. “I like her,” my daughter declared. I also pointed out that Tracy’s dad, Jerry Stiller, was the real-life father of the guy who played Zoolander. “What? No,” my son scoffed. I mean, my daughter’s a good kid, but not that good. Eventually, we got caught up in the musical numbers and even tried out some of the dances, which are tougher than they look. My son—who currently does “The Backpack Dance” any time he’s standing still for longer than two seconds—tried doing the Mashed Potato with me, but we failed. “Who writes a song about a mashed potato?” my daughter wanted to know. “The dances don’t look that hard because you’re just doing the same thing over and over repetitively,” my son noted astutely. This conversation ended as soon as Tracy and Amber engaged in their dueling make-out sessions on the dance floor, prompting horror movie-level shrieks of terror from both kids. “This is not PG,” my son said emphatically. Kissing isn’t the only adult theme Hairspray grapples with. My son confidently asserted that the movie was going to be about how Tracy would “get too caught up in beauty and fame and fortune,” and while I knew he was wrong, I’d forgotten just how much the film becomes about the racial divide of 1960s Baltimore. As the teens visit the record store owned by Ruth Brown’s Motormouth Maybelle, or realize they’re the only white people at the Soul Review, or talk about swimming in integrated pools, we had to keep explaining to our kids what “segregation” meant. And for all their initial dubiousness, it was this angle of Hairspray’s plot that eventually got them hooked. They became heavily invested in all the protest scenes, leading up to the final parking-lot melee between integrationists and the racists that sees the beatings of Tracy’s boyfriend, Link (Michael St. Gerard—whatever happened to him?) and, even more brutally, Penny’s black boyfriend, Seaweed (Clayton Prince). And after Tracy’s arrest leads to Amber getting crowned queen of the auto show, there were many boos coming from my living room. “Imagine if she fell on her face,” my daughter added. After Tracy is sprung from prison and immediately starts dancing on the lawn with her fellow protestors, the kids also weren’t having it. “Get to the frickin’ auto show!” my son yelled. In the end, of course, Tracy stops dancing long enough to take back her rightful crown from a petulant Amber (“Amber is the embodiment of a toddler,” my daughter said). Meanwhile, integration takes hold at both the auto show and on Baltimore TV—and once again, we had to explain to the kids why that was such a big deal. (One unexpected takeaway from Hairspray is that I really need to do a better job educating my kids on the history of civil rights.) I then polled them for their final thoughts. My daughter had some equally disparaging words: “This movie is very unrealistic,” she said, having been especially unsettled by the sight of John Waters, playing a sadistic psychiatrist, going after Penny with an electric cattle prod. “And it sounded like a lot of the people were reading rather than acting.” (It’s a fairly spot-on critique, given that several of Waters’ stars, like Mink Stole, weren’t exactly the most natural actors.) But in the end, she came away with her own important life lesson.